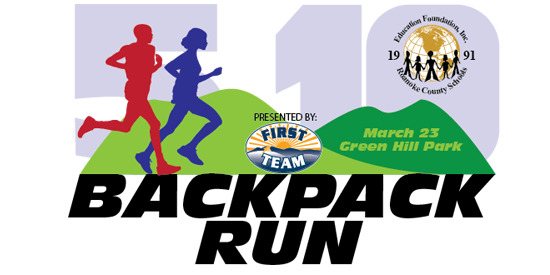 Roanoke County Public Schools Education Foundation, a 501©3 non-profit organization, is presenting the 6th Annual Backpack Run. Proceeds will be used to provide scholarships for graduating seniors and grants for teachers. Several sponsorship levels are available! NEW THIS YEAR: 5K and 10K races! Runners can also take the Backpack Challenge – purchase a new backpack, fill with school supplies, and drop it off after the race! (Optional Event). March 23, 9 a.m. at Green Hill Park. The 5K and 10K will begin at the same time. 5K runners will complete one lap of the out-back course. 10K runners will complete two laps of the same out-back course. Parking will be at Green Hill Park. This is a rain or shine event. Please arrive no later than 8:30 a.m.
PACKET PICKUP will be on Friday, March 22 at Run About Sports on Brambleton Ave. near Hidden Valley High School, from 3:30 p.m. - 7 p.m.